The Beautiful Immortals series 2 is continued with the second instalment of Vampires of Maze. The war between the vamps and weres has been well under way, and it appears that there are few shifters left. Wicce, Julia, travels to England with a small group of weres in the hope of negotiating with the vampires to keep all parties, including humans, alive. But, is it possible to negotiate with such beings? Is she experienced enough? And, what of her personal feelings to the weres around her? She can only keep her distance to a certain degree from those she travels with. As tension runs high, and action is inevitable, you’ll be holding onto your seats with this paranormal thriller series from the talented Tim O’Rourke. Blurb: From Tim O’Rourke #1 bestselling author of ‘Werewolves of Shade’ (Beautiful Immortals Series One) comes ‘Vampires of Maze’ (Beautiful Immortals Series Two) a vampire and werewolf romance with a twist. 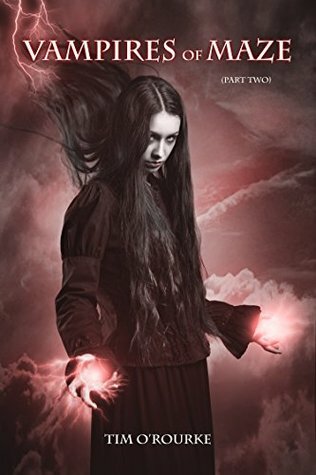 Witch, Julia Miller, has been sent by the Wicce to bring an end to the war that rages between the Beautiful Immortals. Joining a pack of werewolves, Julia must travel with them to a land unknown to her. Here she will learn the horrifying truth about the dark secrets hidden in the town of Maze. To stay alive, Julia will not only have to figure out who to trust but also who to love. For Julia’s worst nightmares are about to get a whole lot more terrifying as she heads into the war raging between the vampires and werewolves where even her own magic abilities won’t be able to protect her. Note: This ends on an unbearable cliff-hanger. Part Three will be published within the next few weeks. Vampires of Maze creates so much suspense and tension that the reader is glued to their seat. Tie that in with the action and gore, and the reader becomes easily addicted, awaiting the next instalment just as many viewers feel towards The Walking Dead (tv series). And, like the tv series, the Beautiful Immortal series leaves you each time on a terrifying cliff-hanger. As a fan of O’Rourke’s work, I am quite prepared for the cliff-hangers, knowing that I will be in suspense until the next instalment, and knowing that they are going to be truly great. And, although they are all usually very surprising and horrifying at times, nothing quite prepared me for the SHOCK I was to find at the end of this particular episode! It’s written fantastically, but will leave you quite gob-smacked (although I am hoping for a different outcome than the one suggested). It’s a great thing we won’t have to wait too long before the next instalment is to be released! Julia, the Wicce, and the small group of werewolves that she has travelled with are bound for where they believe the vampires are in the village of Maze. Although, they both have differing plans on how to end the war between the vampires and wolves; the weres are ready to attack and fight to the vampires death it seems, whereas Julia is hoping to negotiate, thus saving everyone including humans. Is she really that naïve to think the vampires would even listen? Or, can she stun them enough, using her magic, and then speak with them? Julia is mocked and given her fair share of sarcastic comments, especially coming from were Rea. There has already been tension between the two, and this escalates when Julia is found in Trent’s arms after waking from a terrible nightmare. Although an innocent situation, Rea doesn’t exactly see it this way, and it is clear that Rea has deep feelings for her old lover. Will Rea be an enemy of Julia’s or can they reconcile their differences? The were character, Calix, is growing on me more and more. Yes, he opens his mouth, he’s sarcastic and he likes a cheeky feel of Julia every now and then, but there is still a feeling that he has Julia’s back and sometimes has a kind word to say for her, even if he’s unsure of her Wicce ways. In my last review of Vampires of Maze part 1 I likened him to the character of Ajax in the 1970’s cult movie The Warriors, and I still felt the same way in this instalment. My favourite of Tim’s male characters is were Harry Turner from the time-travel paranormal Samantha Carter series, but Calix is great competition for first place. This short story builds up suspense and is not without some fast-paced action, horror and gore. It’s terrifyingly exciting, full of mystery and holds a great deal of atmosphere. You’ll feel a part of the team with Julia and the shifters, and you won’t want to leave it there. I cannot wait for the next part of their journey! A copy of Vampires of Maze part 2 was provided by the author in return for a fair and honest review. Vampires of Maze part 2 is available at Amazon UK and Amazon US. The author, Tim O’Rourke, has 2 signed paperbacks of Vampires of Maze part 1 up for grabs!!! This entry was posted in Competition, Giveaway, Horror, Mystery, New Adult, Paranormal, Review, REVIEWS (ALL) - Reverse Chronological Order and tagged Beaautiful Immortals series 2, book review, Giveaway, horror, mystery, paranormal, short story, signed giveaway, signed paperback, Tim O'Rourke, vampires, Vampires of Maze part 2, werewolves.